Burn The Internet: Have Some Bombs! 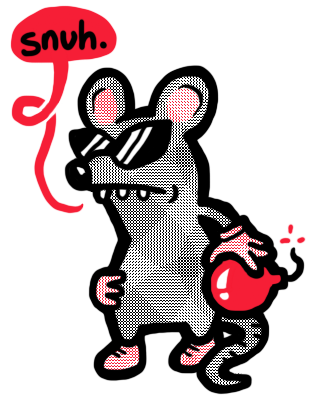 Today's drawing is of SMB2's Mouser, since I've been playing Super Mario Advance recently. I hate the constant voices, but there's something awesome about the game's gratuitous use of giant rotating sprites for the sake of showing off the GBA's power. I wish the later Super Mario Advance games did crazy stuff like that too. This is excellent. I wanted to let you know that I stole it for use as my Twitter avatar. Gratitude!